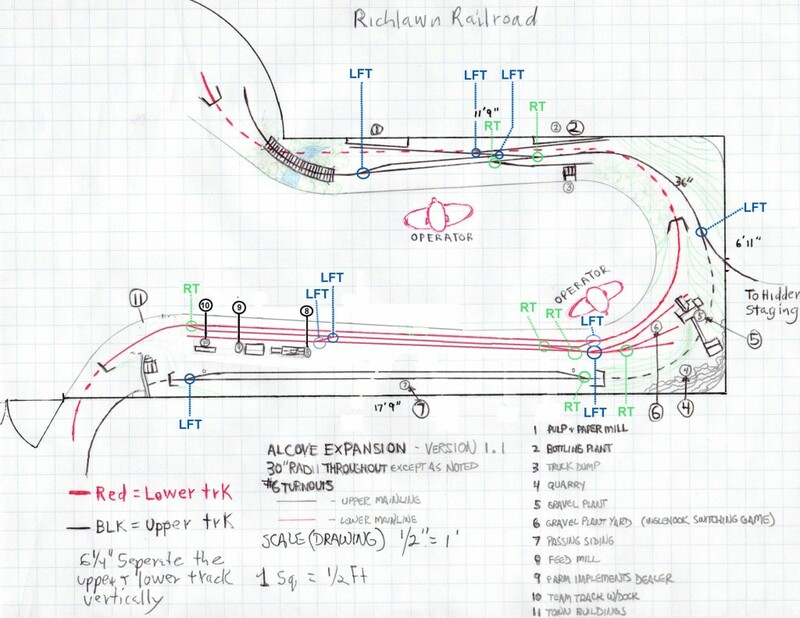 Here’s the basic track plan for the alcove expansion. I’ve made some changes and it’s a work in process. December 27, 2011 – To many this would be a “big woopie” task, but for me it’s a big deal as it’s my very first turnout control panel on the layout. When I first started the layout a few years ago I determined that all mainline turnouts would be controlled by switch motors. I’ve installed the motors as I’ve been building the layout but none of the turnouts have been able to be thrown electrically. if I wanted to operate a turnout I used a push pin and piece of foam to lodge the turnout in the “other” position. Since I’ve actually been doing a little switching in the alcove expansion this became problematic and I was forced to electrify the turnouts. The panel is constructed from a piece of 1/8″ thick Plexaglass which has a piece of double sided sticky film between the back of it and the front of the printed paper with the route and text. Since the outer most part of the panel is the Plexaglass this will keep the printed paper section clean and protected. The LEDs are in series with the Tortoise(tm) switch machine. A 2 pole rotary switch is topped off by a “chicken head” knob which also clearly indicates the position of the turnout. Now I know that I could have done this a number of different ways including manual styles of controlling the turnout, but I wanted to do it “my way”. I’ve about worn out the switch just playing with the darn thing! I need to get back to work making my next panel. Below is a picture of my first turnout control for the Deer Hollow Industrial area. 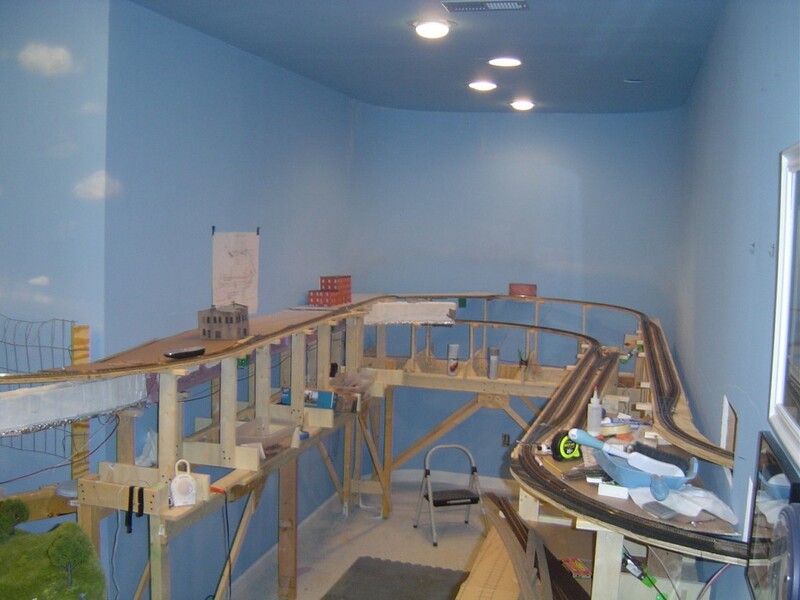 December 18, 2011 – Now that the left rear corner of the alcove is “finished” I’m working on the right rear corner. 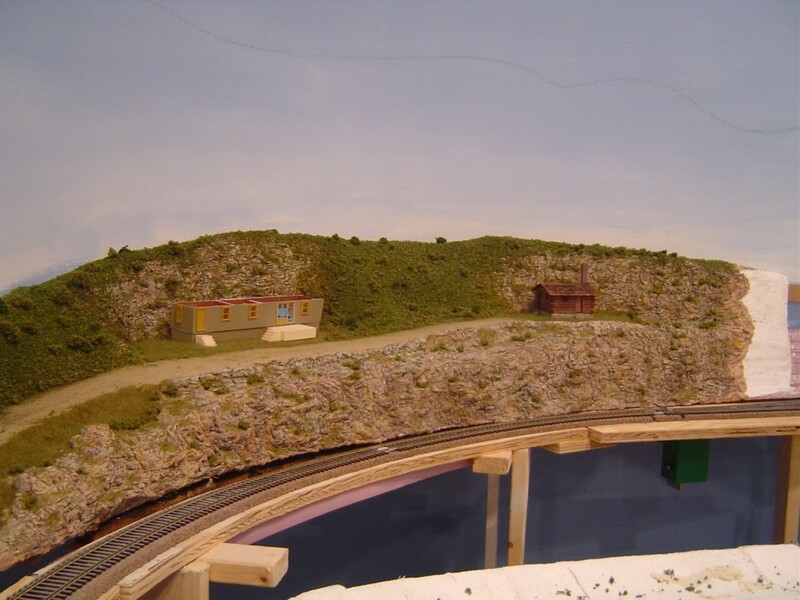 This area will be mainly forest without many details as the foreground in this area will contain the Gravel Plant as the focal point. This is a poor picture, but gives you an overall view of the corner area including the log cabin with outhouse, fence, and propane tank. 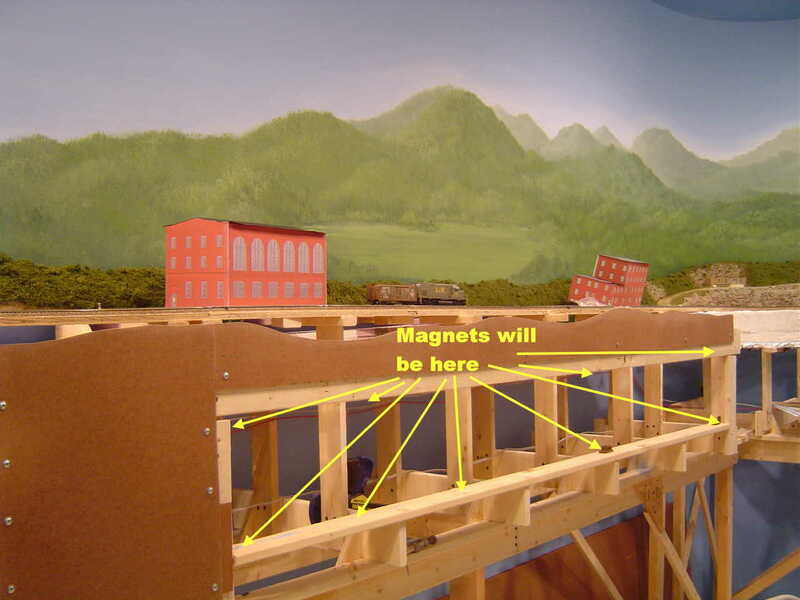 September 24, 2011 – The original alcove scenery plan (yes, there is a plan…not on paper but in my head) included a mountain on the right of the door when entering to give some drama and act as a small view block of the alcove to allow for some “discovery” as you walk into the room. 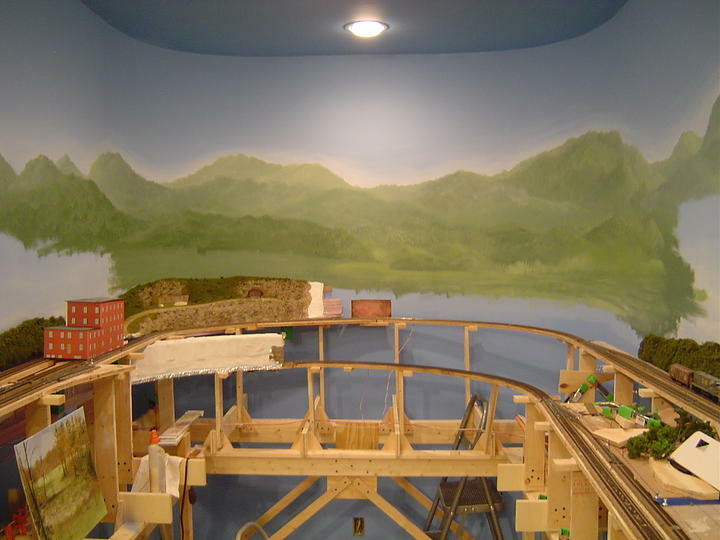 Now that the artist has completed the background mural I can move forward on creating that mountain. Note the neat lodge painted on the mural, which will have tiny fiber optic lights. I first used some paper to sketch the profile of the top of the mountain. Once I got a profile that I liked I transferred that onto some 1″ foam that will be the gluing strip for the cardboard web. I didn’t want to glue the foam to the wall and ruin the mural and I wanted something that could be removed easily if I move. 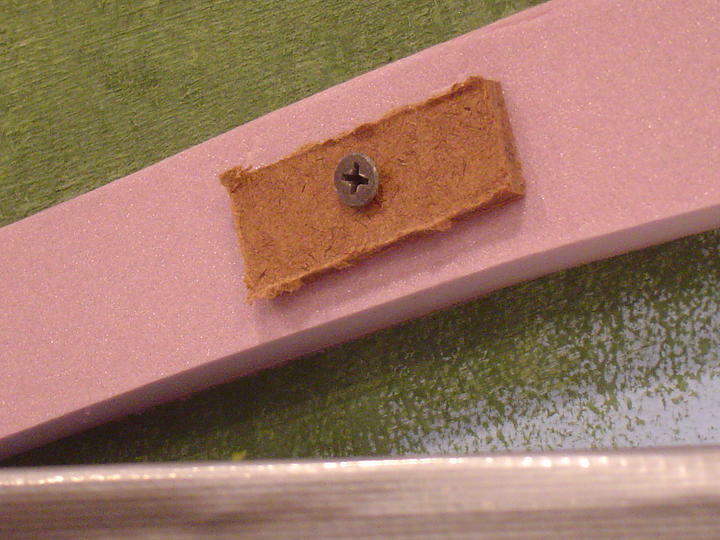 Here you see a closeup of the Masonite “washers” I used with the drywall screws to anchor the foam to the wall. 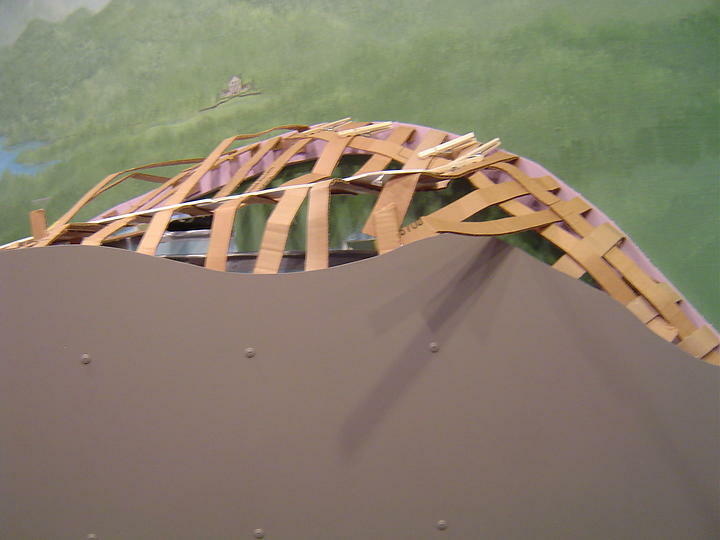 The entire mountain could be removed from the wall by pulling it away thus breaking the foam and leaving the washers and foam pieces.(OUCH!) It then would be a simple matter to remove the screws. 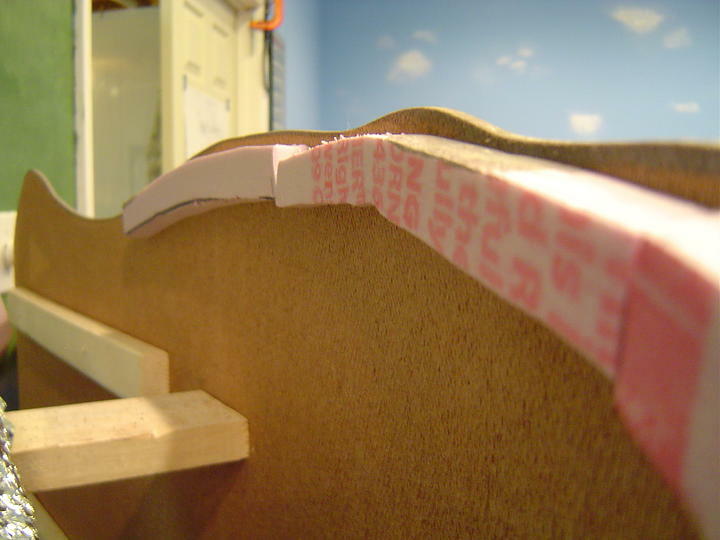 There is a foam gluing strip along the entire fascia for the cardboard strips. This is to act as a sound barrier (I hope) and make it easier to remove the fascia if necessary. The plaster cloth will not come all the way to the fascia and caulking will be used to fill the small gap between the plaster cloth and the fascia. 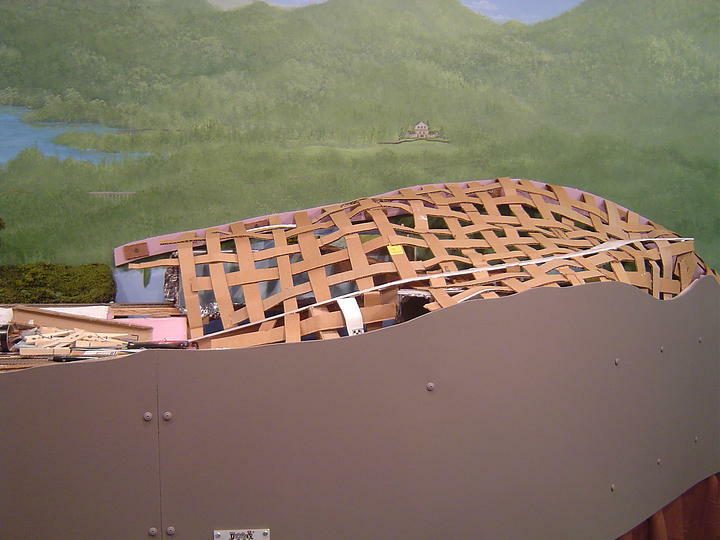 This picture shows some of the cardboard webbing. The white line is a piece of foam board that will be a road going to a little cabin on the mountain. This angle show the road a little better. I’ll do some hand-carved plaster rocks to integrate the tunnel and in other areas on the mountain. I just can’t stop carving! The cardboard webbing work is about completed. Next I’ll add a layer of masking tape so I can “see” the profile better and make any adjustments. From there it will be getting plastered……..I mean plastering the mountain! 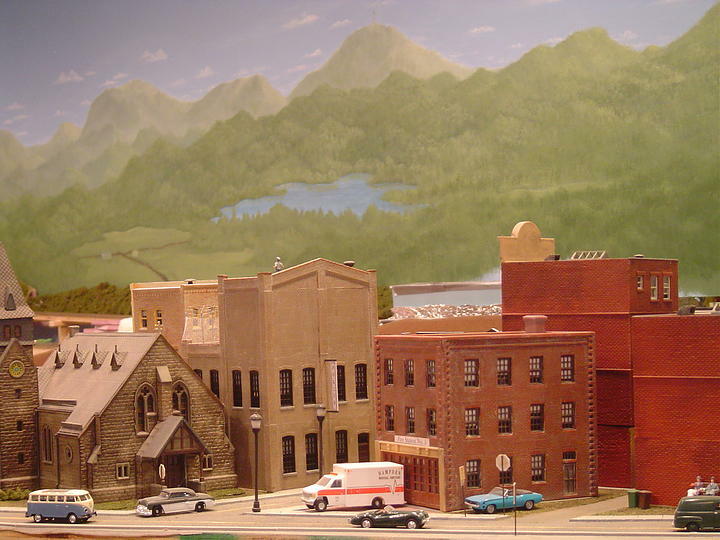 Model railroading is such fun!!! 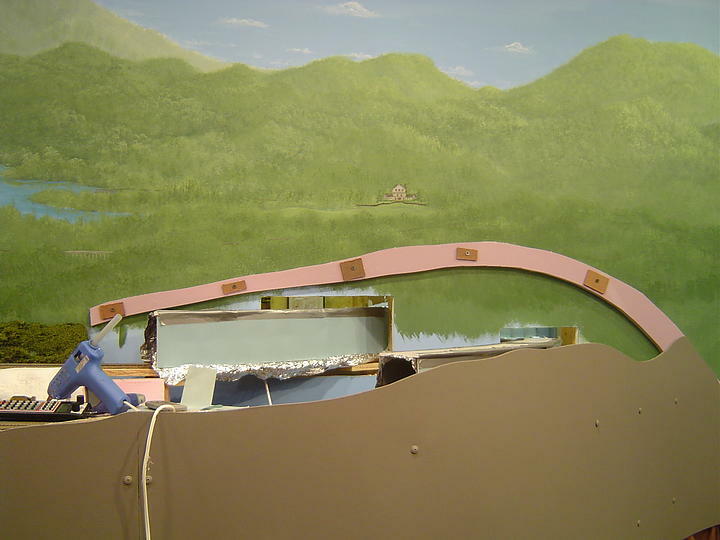 September 16, 2011 – The artist has completed the mural! 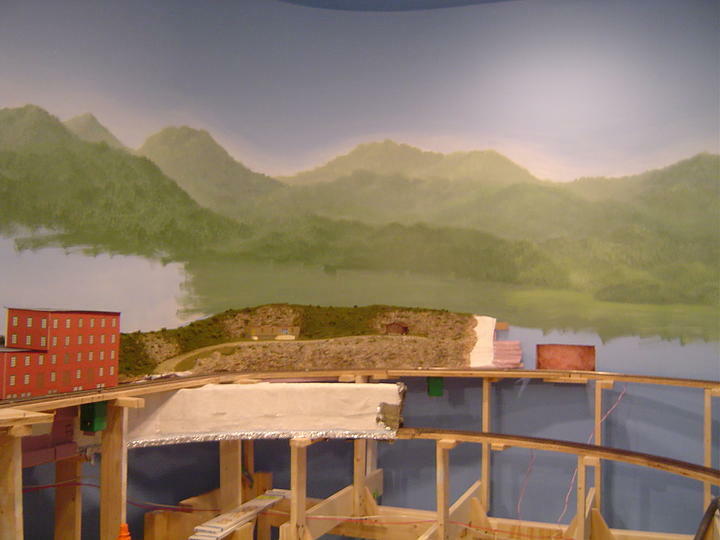 Below is a painting of the lake area. The challenge with the fascia in this area is that there is a tunnel (8 ft long!) in the lower track that must be able to be accessed. The tunnel itself has three hinged doors that can be opened to remove any problems. Since the bench work is narrow in this area (20″) there isn’t room to reach up under the fascia to get in the tunnel doors (unless you are “Rubber Man”!) from underneath. What’s with all of the seams in the fascia? 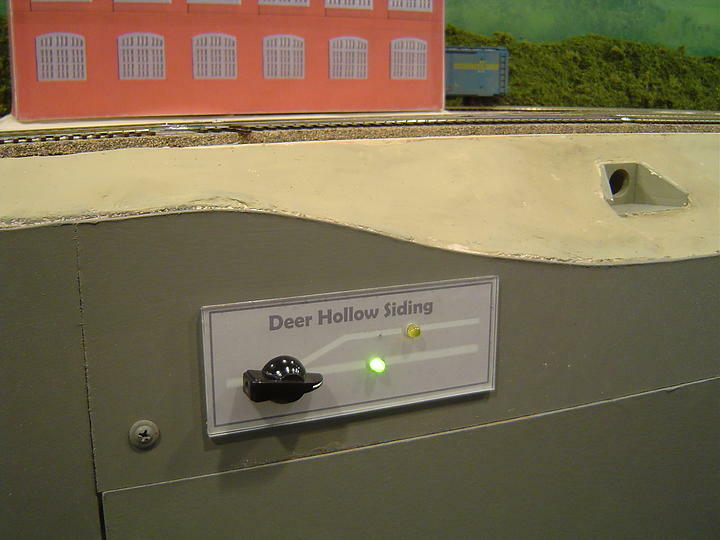 There is a removable panel to allow access to the tunnel. Here’s the fascia with the removable panel removed. It’s still under construction as I haven’t installed all of the magnets. 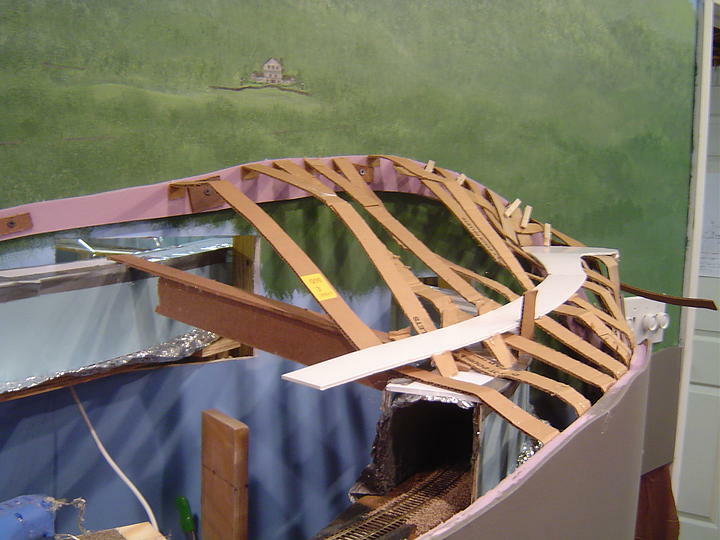 There will also be a lower fixed board that will hang the fascia curtain as the curtain will remain in place when the access panel is removed. Any turnout controls or other goodies would be mounted in the upper fixed fascia. I thought about saving the money on the magnets by not purchasing them and just screwing the access panel in place; however, Mr. Murphy would make sure that I had a bunch of “tunnel troubles” if I tried that. With the magnet mounted access panel it can be popped off in seconds and the tunnel cleared quickly. 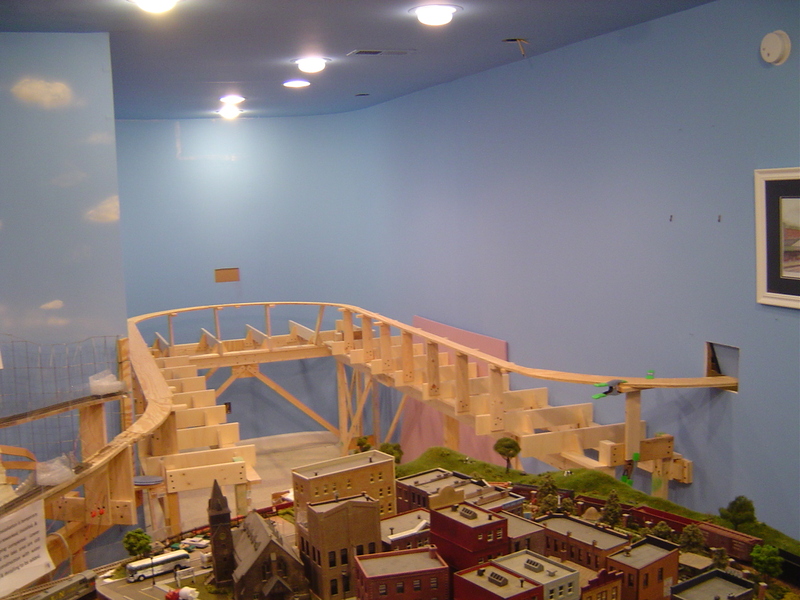 This is a view of the left corner. It’s difficult to see the entire scene. She paints from the top to bottom, so this area is still under construction. Notice the subtle light and areas where the sun is hitting. I’m really liking her work! 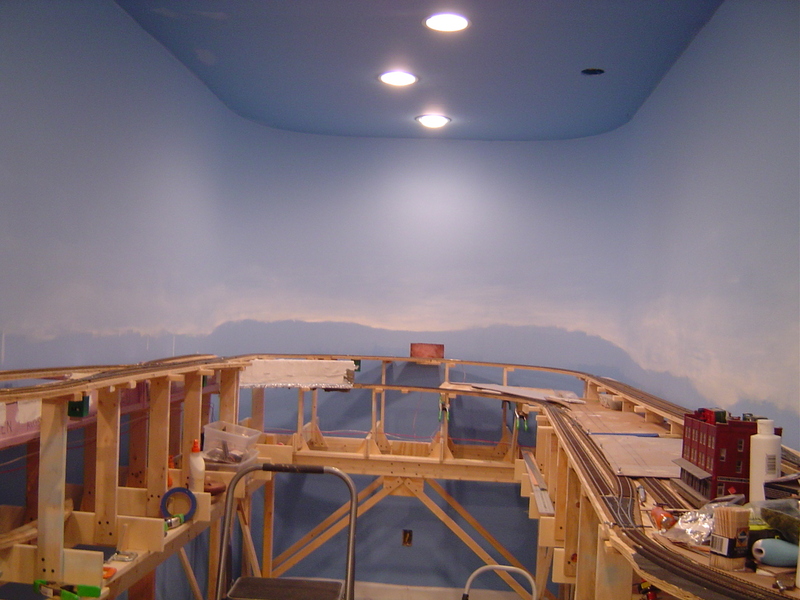 This area on the right is pretty much complete as the mountain section I will install here will come up slightly above the painted area. Notice the meadow area in the foreground. Here you can see both corners. The artist wants to be finished by the end of July, but with that only a week away I think that she is being a little optimistic! 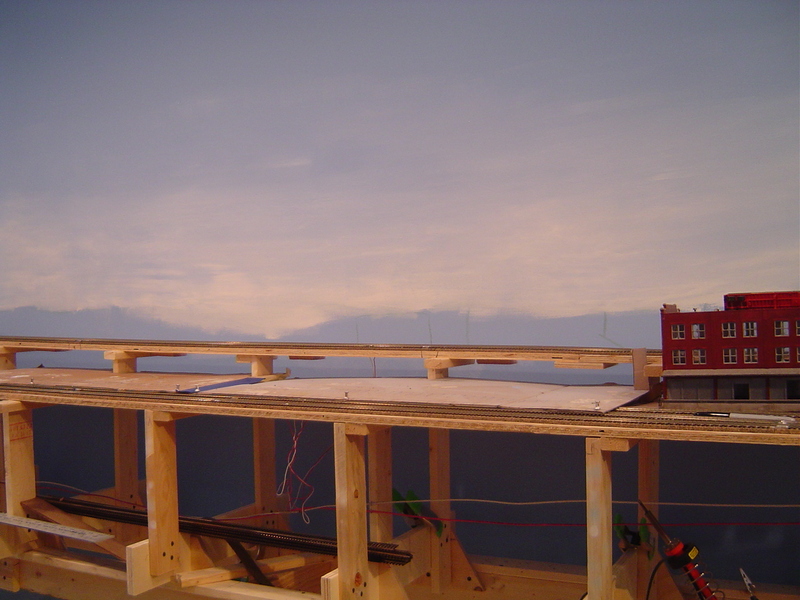 July 21st, 2011 – Work continues at a snail’s pace on the back left corner as I’m working on the two structures there. I’ve just about finished the log cabin which is a kit from one of MRH’s sponsors RsLaserKits. The kit is very easy to assemble and was finished with a brown alcohol wash followed by a brown alcohol wash followed by some weathering powders. The “chinking” between the logs was done using a light gray. 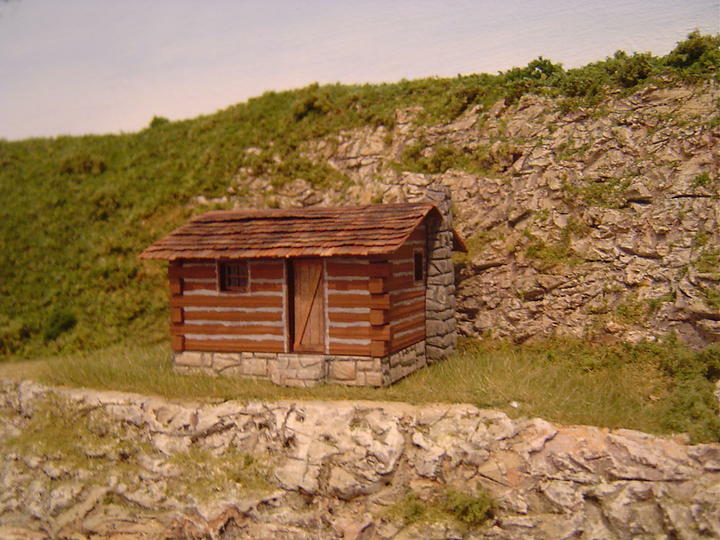 The kit doesn’t come with a foundation but I wanted to add some interesting detail so I cut pieces from a Chooch Enterprises Inc. random stone wall to form the foundation and steps. This is a close up shot of the log cabin. 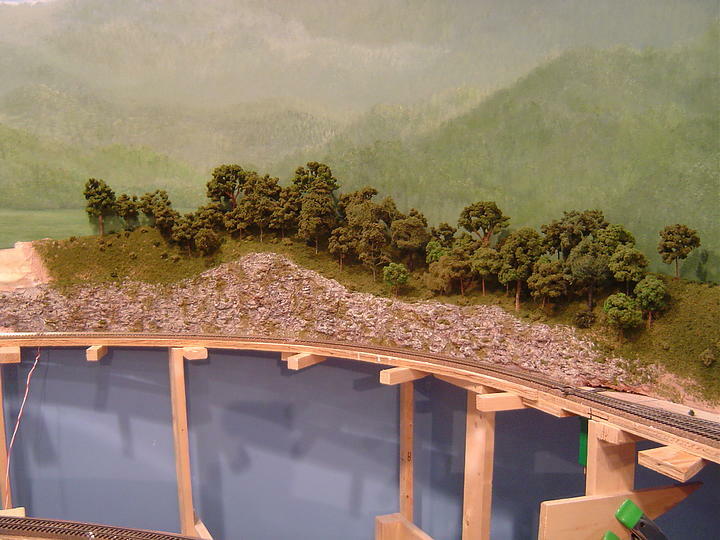 This first picture is just to show the location of the cabin on the scenery area. 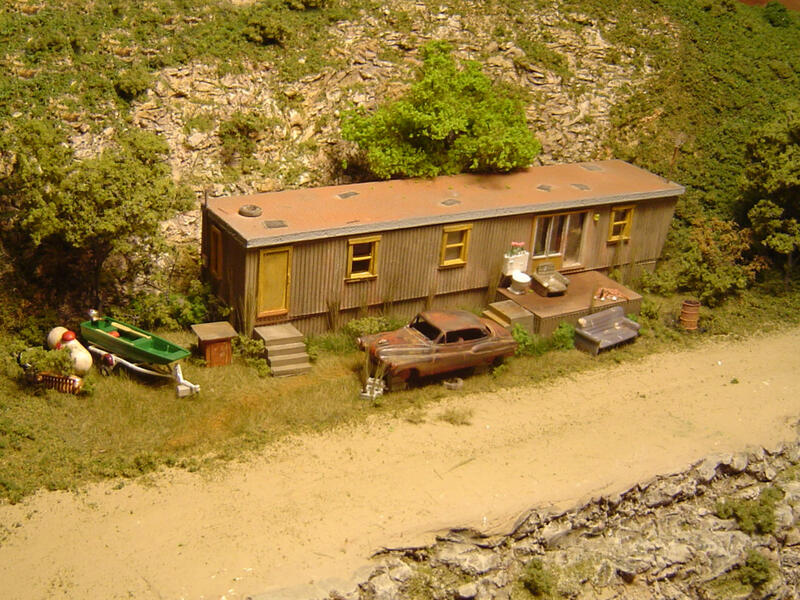 Note the house trailer under construction on the left. 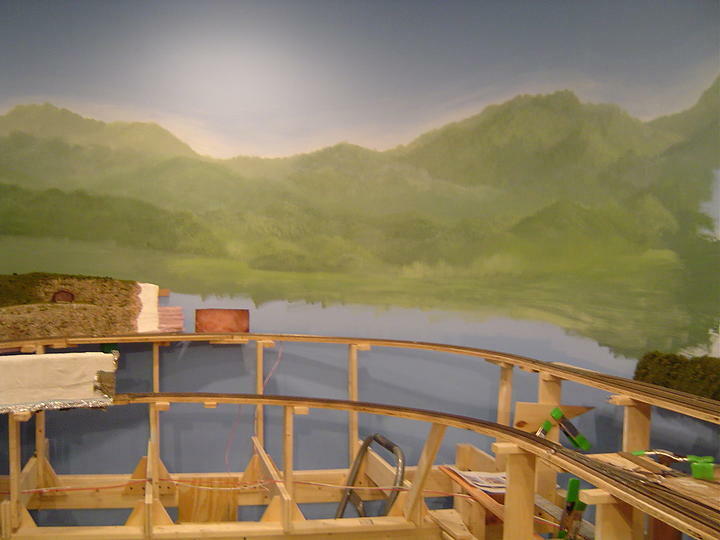 July 8th, 2011 – The artist has started painting the mountains and I’m excited to see the progress! 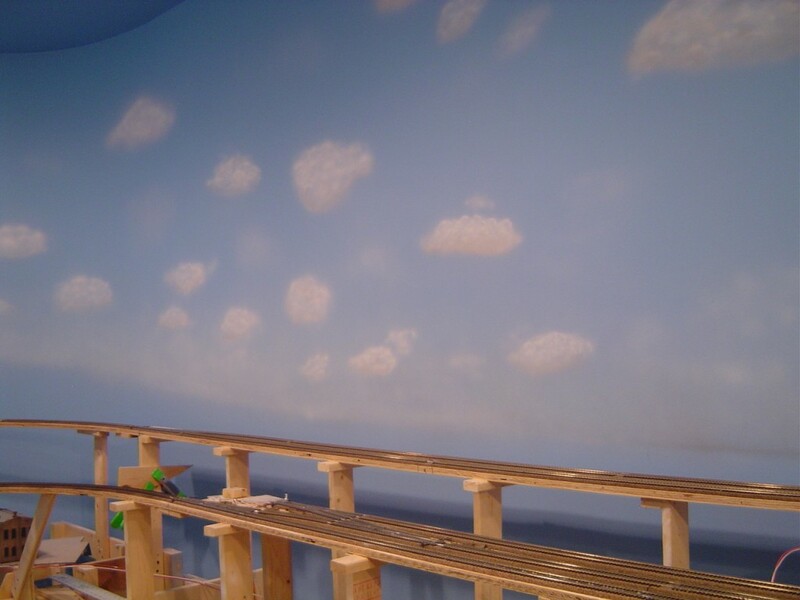 July 3, 2011 – After painting over my attempt at horizon and clouds at my artist’s suggestion she started her part by painting the horizon by blending white with the blue. 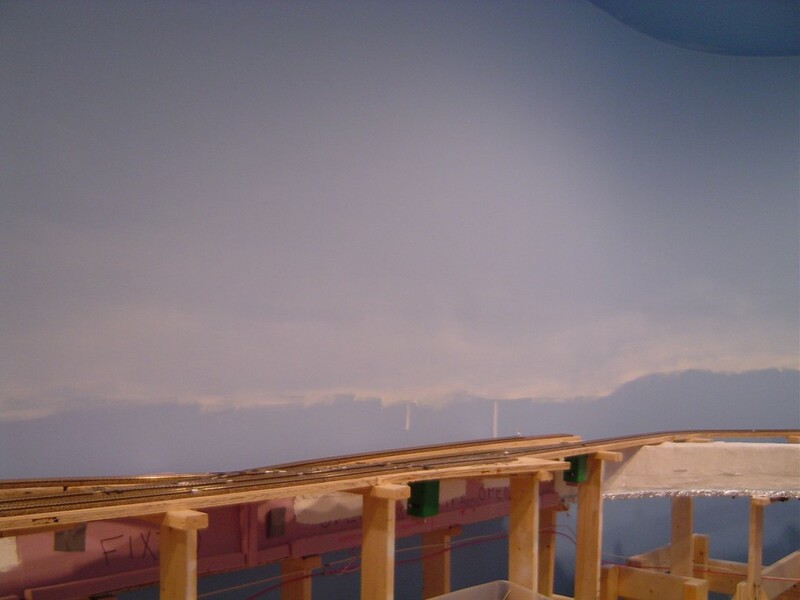 Here’s a view of the horizon looking into the alcove. This is a closer view of the left side. The paint that looks like drips are actually lines where a building will be placed. By the way, the writing on the tunnel side wall that looks like it says “fix” is actually “fixed” – or a non-movable area. In the far left of the photo you can see “access’ which is a hinged panel to allow for clearing tunnel jams. Here’s a closer view of the right side. I really like the job she did on blending the blue and white. She will be painting hills over part of the white, and in this area will paint a small town in the distance. 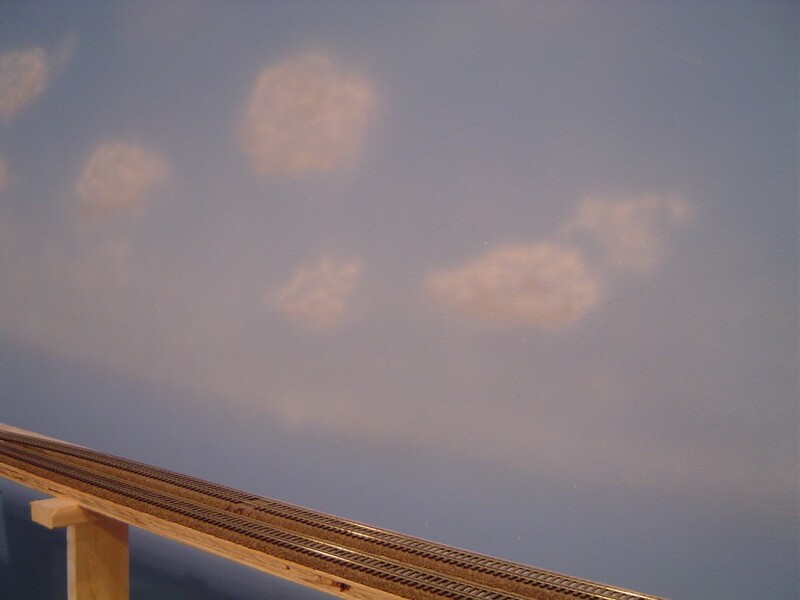 Well, my artist came over the other night for “next steps” and when she saw the clouds she said “they have to go!” Among the things she said about the clouds were “too many”…”too big”….”not realistic”. Ouch! She was the one that told me to paint clouds (after seeing what my clouds looked like on the existing portion) and told me to paint the horizon so she would know where to start painting. So I’ve got to go over to the Big Box store to purchase more blue paint and roll over my clouds and horizon! She will be coming over soon to start sketching the painting so I hope to have some pictures that I can post here. 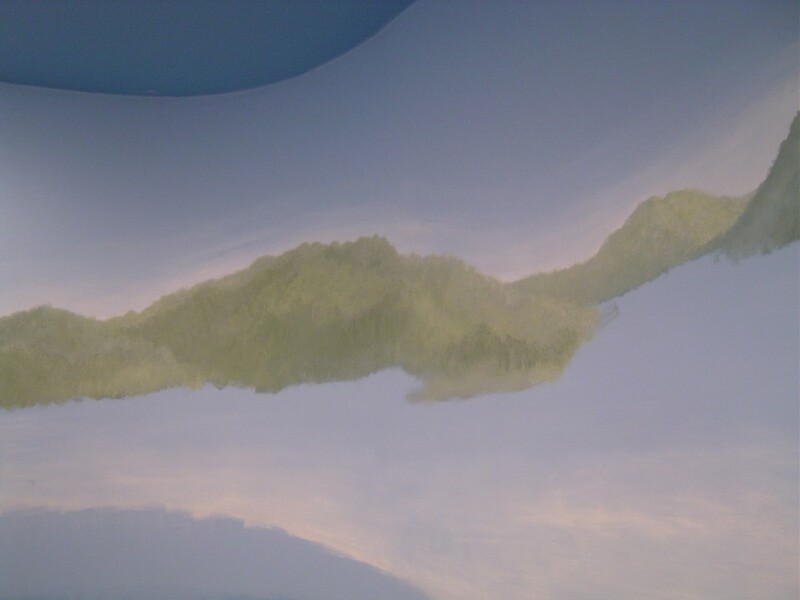 I’ve been working on the backdrop in the alcove area which will have scenery painted on it by a local artist. As part of the prep the artist wanted me to rough in the horizon and do the clouds. 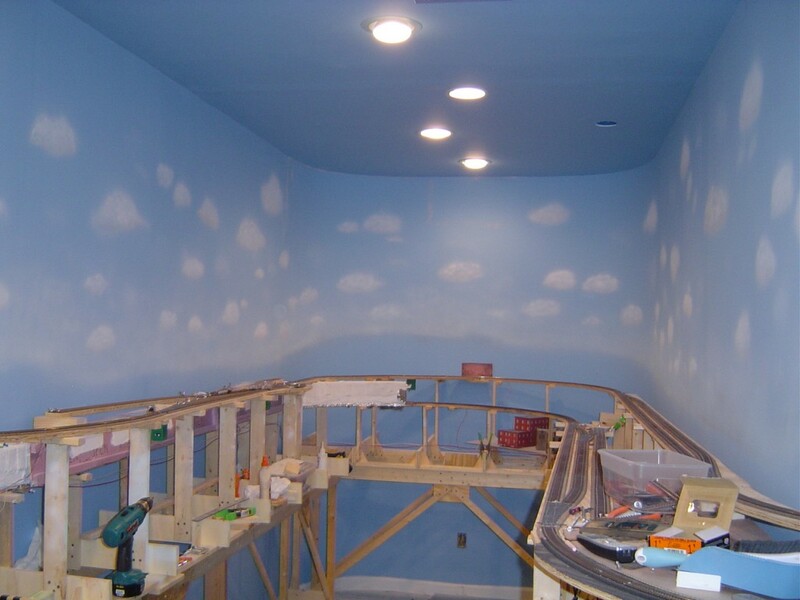 The reason she wanted me to do the clouds is NOT because I do great clouds, but so the clouds in the new alcove addition would match the ones I painted in the existing area. 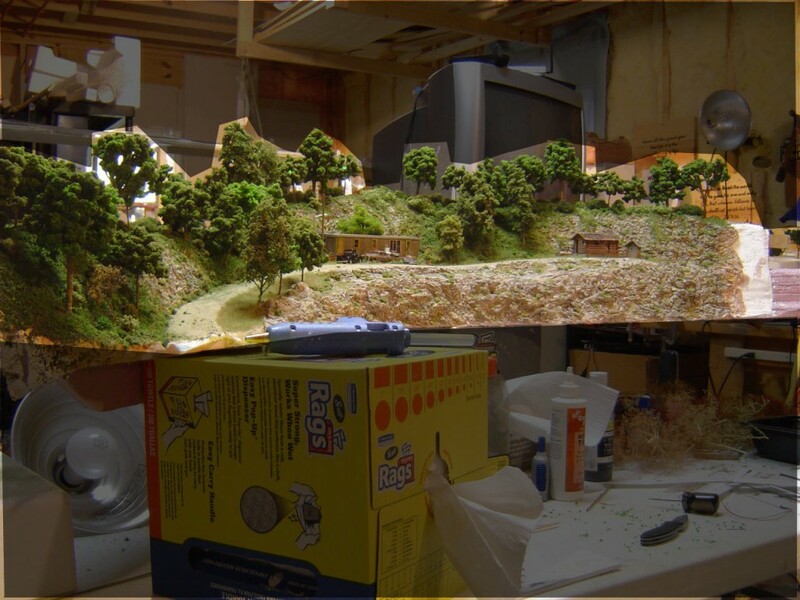 There will be landscape (foam or plaster cloth) that will rise up from the bench work near the backdrop, but be about 1″ away. I like the way it looks with a little separation between the two. All of the painting was done freehand (no templates) with an airbrush. Here’s a shot of the left wall. This is a closer view of the clouds on the right wall. And finally, here’s a view looking into the alcove from the existing area. At present it looks like too much clouds / too overpowering. 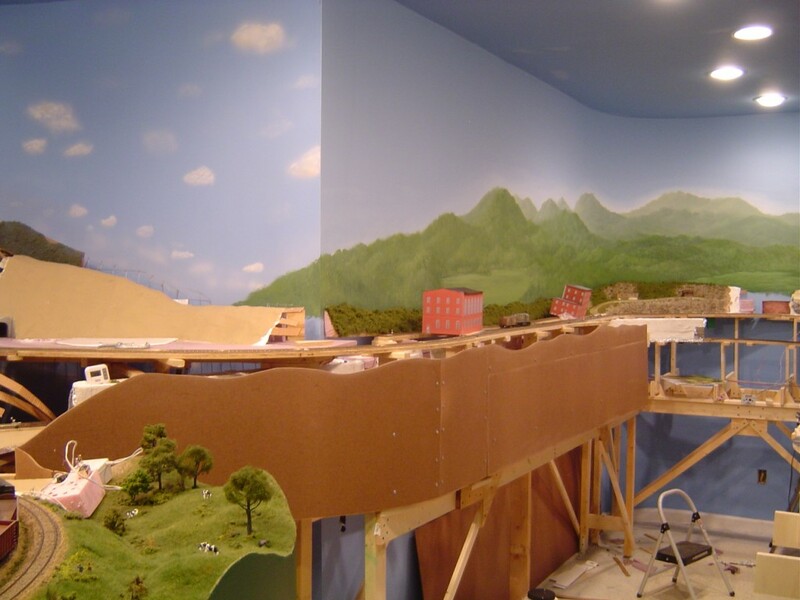 Once the landscape is painted on the backdrop and the foreground area is completed it should look much better. This picture shows both the upper and lower level mainlines along with the passing track on the upper mainline and some sidings. 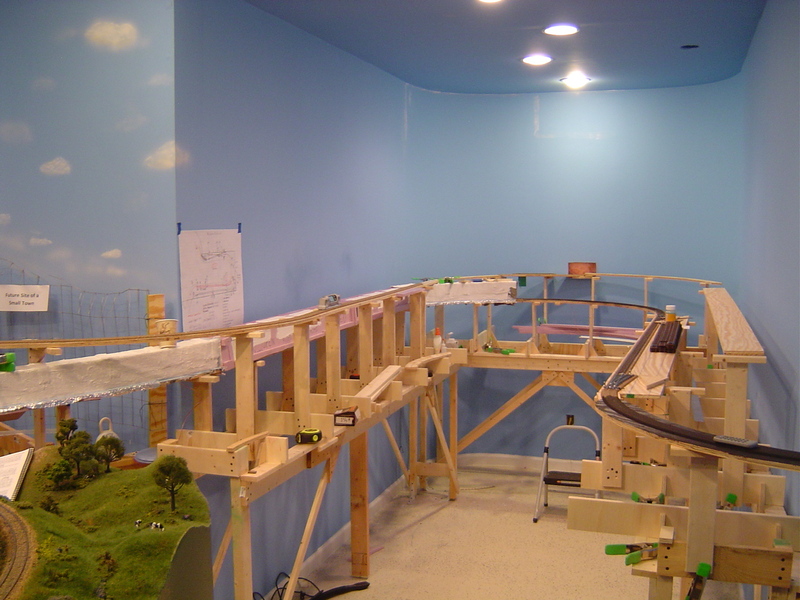 The track is now once again a continuous loop with the connection of the alcove portion to a loop outside of the room. Please see a video on this in the “Videos” section of this website. 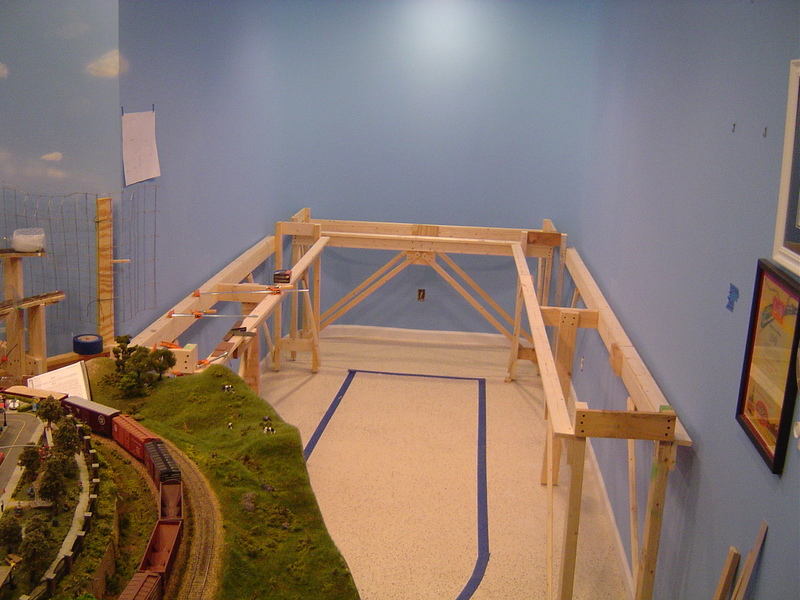 Work has started on the upper level track sub-roadbed. Work is under way on the sub-roadbed for the Southbound route and it has made it through the wall! 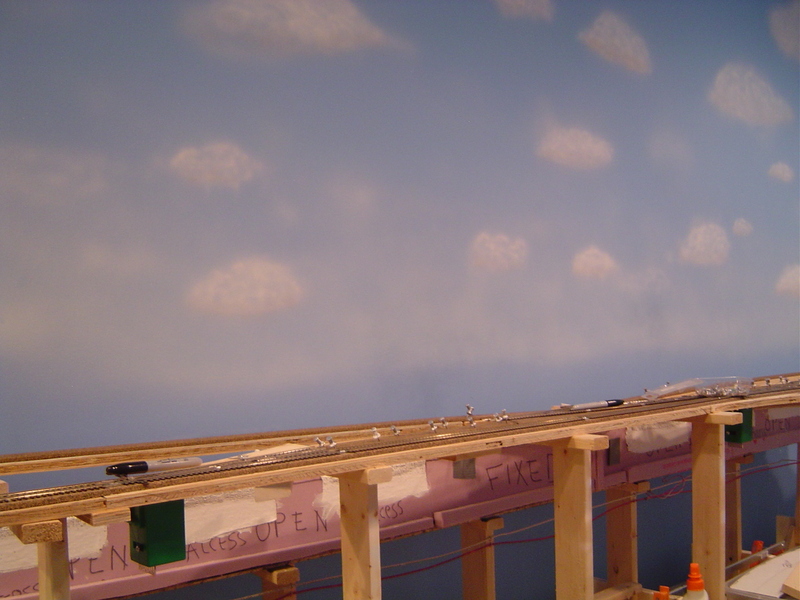 The sub-roadbed thus far does not have any of the sidings attached as that will be one of the next steps. 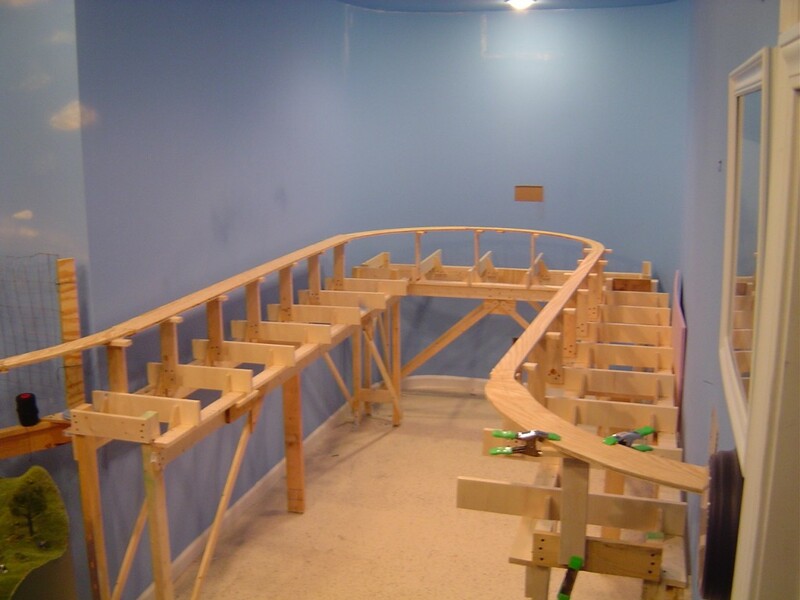 Here are some risers with cleats that will be attached to the joists to support the track sub-roadbed. Here’s a closeup of the riser with cleat. 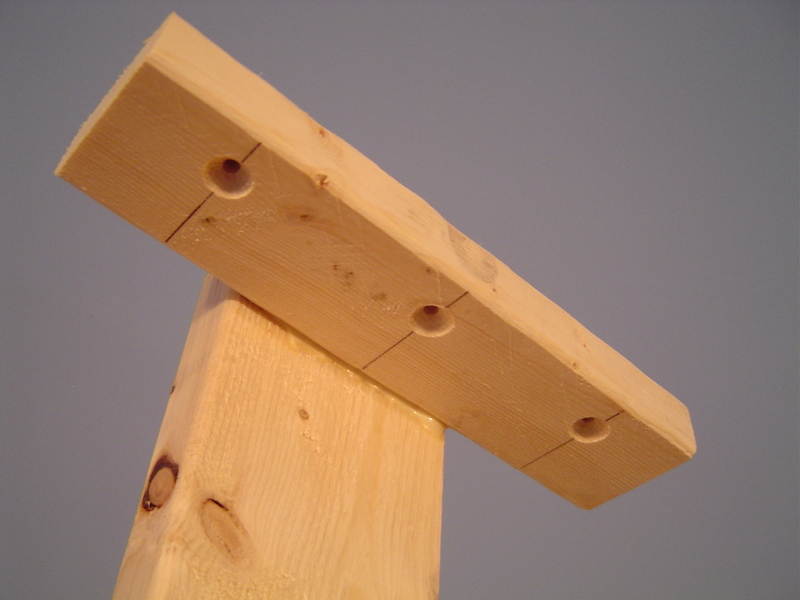 Notice that the holes are countersunk and offset. Screws will be inserted into the holes to attach to the bottom of the sub-roadbed.